Traditional Hindu Bengali marriage rituals are very colourful,full of enjoyment and the whole occasion performs like a festival to the bride and groom family.It can be divided into three steps. Arrange Marriage/Matchmaking-For matrimonial alliances usually the parents or relatives of the prospective Bengali brides or prospective Bengali grooms takes help of Ghataks or Matchmaker and classified matrimonial newspaper advertisement. But in this fast internet age some popular online matrimony or matrimonial sites have made the bridegroom matchmaking job very easy ,transparent and effective. Depending on financial position like any other Indian communities Bengali community is also divided into four categories- low,middle,upper and rich.Apart from financial other basics like education, culture,physical attributes(height,weight,complexion,looks etc) and location there are some other facts that contributes an essential part during bridegroom matchmaking. In Bengali the brides and grooms are known as Patri and Patro respectively. In the time of matchmaking the Patro,Patri and their family categorize themselves as Purbobongio Patro and Purbobongio Patri or Poschimbongio Patro and Poschimbongio Patri on the basis of their origin.After selecting the same origin most of the Bengali Brides and Bengali Grooms prefer to find life partner within their own caste like- Brahmins, Kayastha, Baishya, Khatriya, Mahisya, Namohsudra, Napit, Sodegope, Subornobnik, Suri, Sutrodhor, Tili, Tantubai, Jadav, Sothchasi, Mahato, Poundro, Modak, S.C. etc.Sometimes some Bengali families even consider the sub caste like Kulin Brahmins,Rudrojo Brahmins,Barendro Brahmins,Rari Brahmins,Maithili Brahmins etc. After considering all those caste,subcaste matter Kustibichar or Horoscope matching of bride and groom comes as an integral part of matchmaking before marriage. Very popular astrological terms like Patro Patrir Mangolik doshgun bichar,Gona(DEB,NARO,DEBARI)bichar,Jotok bichar,Rashi,Logno bichar etc fall under this particular section.If all goes okay then the brides family or Patripokho makes an appointment with Groom’s family or Patropokho to proceed further. Fixing Marriage Date/’Paka Dekha’-In this day the elders and family members of both the bride and groom’s family sit together on either side home and fix an auspicious Day and Time(Lagno) with the help of Priest and Panjika.Next they write it on a paper with other necessary information and sign it by the elder most members of both the families. This paper is known as Pati Patro.After that both the family members celebrate the event with sweets or ‘Mistimukh’. Engagement/Ashirbaad-Usually the occasion takes place few days before the Marriage date.In this event the elders of groom’s family visits to the bride’s place and bless her one by one with Gold gifts and hard cash.Priest performs some Puja in front of Lord Narayana sila and the bride’s family ancestral God idol or ‘Kuldevta’.After that the elders of the bride’s family goes to the groom’s house and bless him with Gold chain, Gold button, watch and other gifts. Bachelor and Spinster Meal/Aai Buro Bhaat-The family members of brides cook several delicious Bengali dishes or the favorite dishes of the bride and offer to the bride with lots of attention, care and celebrate the occasion as the last meal before marriage. This event is also celebrated in the same manner at the groom’s house. Purification of Wedding Piris – During the time of marriage ceremony the bride and groom sits on a wooden slab or piri.These piris are brought to the brides house a day before the marriage date. After that the piris are purified by decorating with painting/ alponas and play conch shells/sankhodhani and deliver auspicious sound with the help of tounge or Uludhoni or Joker. Dodhi Mangol- In the Wedding day before sunrise both the bride and groom are fed a mixture of misti doi or sweet curd and chira or khoi (A type of dry rice) since they will be fasting the whole day since marriage.Then the married women, relatives of both families visit separately to the nearby water body, specially Ganga to invite the river Ganges in their wedding ceremony and return with a pitcher of water which is to be used for bathing of bride and groom. and other rituals. Nandimukh Vridhi Ceremony- In this event the eldest Male member of the family and priest performs puja in front of Lord Narayana Sila to honour all the ancestors of both the bride and the groom and request them to bless the would be couple in their new life.Nandimukh is a prayer where by the family take the blessing of the forefathers who are no more alive. Turmeric Ceremony or Gayeholud-In this ceremony the female members of the groom’s family make a paste of turmeric or holud and keep it in a container. After that they along with the kids apply some portion of the holud on groom’s bare body with lots of joy and making auspicious sound like sankhadhani and uludhoni.Then rest of the portion in the same container is send to bride’s house for the bride’s use in the same manner.Few members of the groom’s family carry the turmeric to the bride’s house along with some other gifts or gayeholud tattya. Gae Halud Tattya-It depends but there are few mandatory items like the Wedding dresses(Benarashi saree etc )and cosmetics for the bride,dresses for the bride’s parent and eldest family member,a rohu fish,sweets,misti dohi,paan,dhaan,durba. Adhibas Tattya-These are the gift items that goes to the groom’s house from bride’s family mainly consist of wedding dresses(dhoti,Punjabi,sandals etc) and toiletries for the groom,dresses for the groom’s parent and eldest member of the family and a rohu fish,sweets,misti dohi,paan,dhaan,durba. Kubi Patta-Takes place in the house of the bride and groom on the day of the marriage.This ceremony to worship Saint Kuber.Family members place three metal glasses filled to the brim with dhaan,khoi(pulses) and crushed rice at the altar of the Saint. Snan -The snan or bathing ceremony takes place in the late afternoon or the evening.After snan the bride and groom must wear the new set of clothes that have been presented to them by their in-laws. Sankha Porano –After the snan the married women or eao strees of the bride’s family helps her to wear Sankha,Pola or conch shell which are white and red bangles that have been dipped in turmeric water along with the new dress. Sringar of the Bride/Bridal Make up-The bride adorns herself in all her bridal attire.Her hair is tied into a bun and covered with a veil.The mukut is traced on her face using the chandan paste.The bride must sit with the gaach kouto and kaajal laata for the ceremonies that follow. Biyer Mandap/ The wedding stage-The Mandap is the place where the wedding ceremony is performen.In a typical Bengali wedding two banana trees are planted at the mandap and a large alpana,is made with the rice paste.The mandap is decorated with flowers and lights. Bengali Marriage Ceremony- Bengali marriage timing or subhologno generally falls in the evening.The marriage ceremony is arranged by the bride’s family. They send a car decorated with flowers to bring the groom on the wedding venue.The groom rides the car with Borokorta, Neet Bor and friends.Before leaving for the wedding venue the groom is blessed by his mother and he formally seeks permission from her for his new life that he is going to start with his would be better half.The groom’s mother does not attend the wedding as it is believed to have negative impact on her son’s married life.After arrival on the wedding venue the elderly female members of the bride family welcome the groom with sankhadhani,uludhoni and ghontadhoni.These dhonies or sounds are considered auspicious in Hindu rituals.A barandala is held by an elder female relative of the bride’s and the dala is first touched to the groom’s forehead then to the ground and back again to his foreheads in a gesture of part blessing,part reverence.Pobitra Ganga jol is sprinkled on the doorstep as the groom steps into the house to mark the auspicious moment.The groom is offered sweets and sarbot.Then the bride’s family gifts the groom with the wedding attire ,which includes a jore ,dhoti and topor.The groom has to wear these clothes throughout the wedding rituals.There are purohits from both families and the wedding is conducted in the form of dialogue between them using Sanskrit mantras.A yagyakundo is made for bringing the Agni Devta or Fire God as the witness of the marriage.The wood for this yogya comes from the groom’s family. While the groom participate in the main wedding ritual from the beginning the bride joins it much later after she is brought by her brothers and friends seated on wedding piri.This is followed by the saat paak when the bride encircled the groom seven times still sitting on the piri covering her face with paan pata.Then comes the subhodrishti when the bride finally puts down the paan pata and her eyes and groom’s eyes meeting each other followed by mala badal . In these saat paak,subhodrishti and malabadal time both the family members and friends through flowers to them performs heavy sankhodhoni and uludhoni.Next the eldest male relative performs the konnasomprodan.Then the loose ends of the bride and groom’s dresses are tied in a knot called ‘jor bandha’ or ‘gaat bandhan’ and this is done by the groom sister where the bride’s brother assist the couple in offering anjali of khoi to the agni or Fire God.After all these the couple sits side by side and cannot open the knot by which they have been tied together.It is followed by the basorghar.In the mean time pritybhoj or dinner is offered and served to the invitees and the groom’s family borjatri which is arranged by the bride’s family. Basarghar-After all these the bride and groom are send to a room called basarghar. the couple sits side by side and cannot open the knot by which they have been tied together. This is a merry making time.The couple, younger relatives of both the families ,friends exchange jokes and share lighter moments with each other throughout the night.The elders usually does not participate in this event. Bashi Biye-The next finally comes the sindurdaan.The groom fills the bride’s forehead with sindoor.After putting the sindoor the bride’s forehead is covered with a saree called the lojja bostro which is gifted by the groom himself.He has to perform this ritual by looking into a mirror.After this,the newly wed couple goes to the mandap and worships the Sun God in front of the priest who makes them chant “surya mantra”. Bidai Ceremony-In this ceremony the bride leaves her own house with the groom and sets off for the groom’s house by taking blessing from the elders. Bou Baran-In this ritual the newly wed couple arrives at the groom’s house where they are welcomed by the grooms mother and all other members of the family .Then the elders give gifts of gold to the bride.The bride is then asked to walk with her feet dipped in aalta on a sari and her footprints are regarded as those of Lakshmi entering the groom’s house.She is then shown the kitchen, store room and all other things signifying prosperity,wealth and happiness for the new family. Bou Bhat-In this ritual the bride herself serves the first meal to her new family members.This ceremony is a sign of acceptance from her new family members and knowing the relatives and other family members.Later in the evening a gate together with relatives and friends through by the groom’s family which is known as Boubhat reception party.It is a gala dinner party.The bride’s family members also attend the reception . Phul Sajja/Flower Bed-In this ceremony the newly wed couple’s bed beautifully decorated with phul or flowers,hence the term Phool-sajja.All these flower decorations and new dresses usually comes from the brides house.This is the night of consummation. Oshto Mangal/Dira-Gamon-Eight days after marriage the newly wed couple visits the bride’s house and spends three nights there. At this time the ‘Gatbandhan’ opening ceremony takes place with sankhadhani and uludhoni. 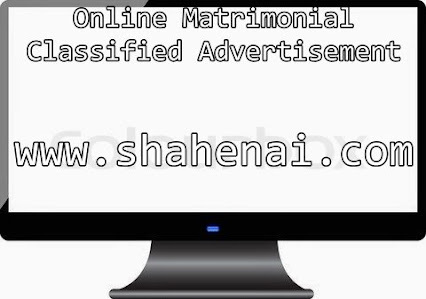 Classified Matrimonial Advertisement——–Years back there was a time when people used to communicate with distant friends and relatives by posting letter, sending telegram, booking trunkcall.But with the advent of modern technology nowadays through internet and mobile phone you can easily communicate with anybody in any part of the World within no time. Likewise with the change of time other aspects of life has also changed. One of them is the way of searching matrimonial alliances. Life partner searching or searching perfect bride or searching perfect groom for yourself or your near and dear one is not an easy task for arrange marriage in Indian communities. To make it happen parents and candidate depend heavily on local print media classified matrimonial advertisement,resulting lots of unwanted phone calls which make you exhausted. By seeing few words details of a candidate communication regarding marriage has never been a convincing process. But people have opted the process by seeing no other alternative. Now with the bless of modern technology and changing lifestyle lots of unmarried boys and unmarried girls and their parents and relatives are feeling comfortable to use online matrimony to search bride and groom. Here a prospective bride or prospective groom and their family can get approximately 70%-90% details including picture, family details of a candidate. So before proceeding further on such an important event of life people are becoming more informed about each other,resulting saving lots of time, avoiding unwanted phone calls and other disturbances.